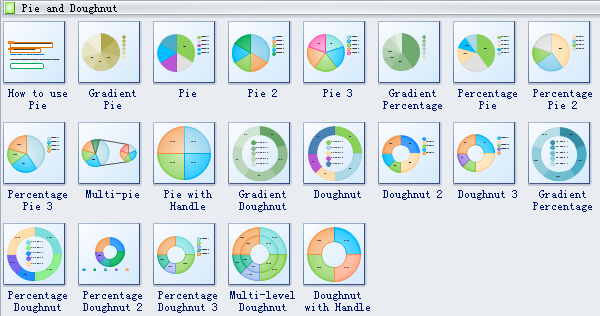 Edraw doughnut software software provides you lot of special doughnut shapes, such as gradient doughnut, doughnut with handle, etc. All these shapes will enable you to draw a wonderful doughnut diagram. 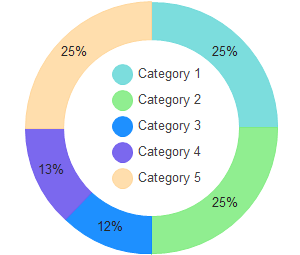 Doughnut chart shapes like gradient doughnut, doughnut with handle are available. Moreover, there are lots of beautiful backgrounds for you to choose. 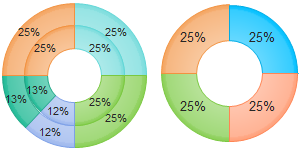 Doughnut chart is functionally identical to pie chart, it also has single-series and multi-series versions, the only difference is that it has a hole in the middle. Gradient Doughnut chart is the doughnut chart which changes color gradually to visually display the data. Percentage doughnut means dividing the circle into 100 percentage parts and then allocate the number of percentage parts required for each item. Need fresh looking doughnut char symbols for your design? These doughnut char symbols are a cinch to pop in. And their crisp, fine detail will make spectacular, easy-to-understand diagrams and presentations to your customers. 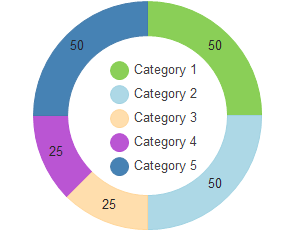 Doughnut Chart Symbols here are smart shapes with floating button or control handles. To find out how to use them, drag them on the canvas, then rest the cursor over the shape and see the floating action button. The control handles appear when shapes are selected. Click the floating menu to make necessary modifications. Most of the control handles are for rotating doughnut shapes. A special case is the Doughnut with Handle. Dragging its handles can change percentage directly, which is faster than entering numbers.